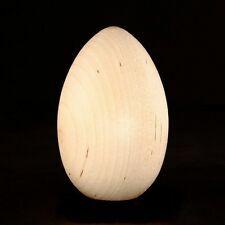 Also, if you have chickens, you can paint these eggs to look like real brown or white eggs and then place them in the nesting boxes. When you use dummy eggs in the nesting boxes, the chickens will recognize where they are supposed to lay the eggs. Great for rabbit, chicken, hen, ferret and other animals. Suitable for: Chicken,Hen,Rabbit,Guinea Pig or Ferret. This hutch is similar to a bunk bed as there are two cages stacked on each other. The house includes raised legs to keep it off the ground and makes it much more difficult for any other pests to be able to enter. This house is constructed by high quality solid Fir wood. The green Asphalt roof provides a rain and sun heat protection. All joints are mortise and tenon. The Spray wire is solid and Non-toxic in case your animals like to chew. They know what it takes to be a loyal animal lover, so each product from Trixie is designed specifically with the animal's best interests in mind. Provides safety and security. Accommodates up to 4 light and Bantam ducks. LARGE OUTDOOR RUN: The hen house attaches to a wide open fenced enclosure that allows them plenty of room to move around without the fear of predators.|WELL DESIGNED: A variety of accommodating features awaits your chickens including a chicken nesting box with a hinged top that offers an easy way to deposit and collect eggs, 2 perches inside for your chickens to roost on during the day or night, a door that acts as a ramp, and slide slots that allows for proper ventilation and airflow.|STURDY AND SECURE: The chicken house attaches to a galvanized chicken wire fenced enclosure that allows your animals plenty of room to move around without the fear of predators. Security features include lockable metal bolt doors and a galvanized wire run to protect your animals.|READILY PORTABLE: Wheels mak. 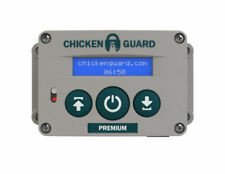 ASTi Premium Chickenguard Automatic Chicken Coop Door Opener (Opener Only). Running on only 4 x AA batteries (or external power with the built-in USB port), our ASTi Door Opener has been designed with ease of use in mind. For keeping the rabbit hutch outside, the hinged open/close roof boasts waterproof asphalt to keep your pets dry. The two-tier construction of the hutch pr ovides separate areas for rest and play. Your pet simply walks down the ramp provided to access the run area, where they will have more room to move around. No worries and no fuss trying to assembly your chicken coop; no following vague instructions. Extra sturdy and durable! Not just functional but attractive too! All-in-one design is easy to manage and easy to clean! The roofed run attached to the hutch is included. Nesting box included. All solid fir wood. Slatted wood roof,can be opened. Two running areas, they can be put together in one side or in two sides. 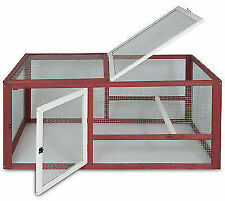 For keeping the rabbit hutch outside, the hinged open/close roof boasts waterproof asphalt to keep your pets dry. The two-tier construction of the hutch provides separate areas for rest and play. Your pet simply walks down the ramp provided to access the run area, where they will have more room to move around. 【Wire-style enclosure】 The plated iron wire style enclosure allows for proper ventilation and ease of viewing while giving your furry friend a rabbit playpen. 【A Comfortable Habitat for Your Friend】Waterproof roof prevent water penetration, provide your chicken with an affordable, durable and comfortable habitat, a cozy multilevel design with a ramp between levels provides both a sleeping and play space for your friend. They are also fantastic for fish, hedgehogs, turtles, and a variety of hard-to attract wild birds. ManufacturerPICKY NEB. √ Chickens, turkeys, ducks, etc. You can rest assured knowing that this high-energy treat will attract robins, bluebirds, woodpeckers, cardinals, wrens and other hard-to-attract wild birds. 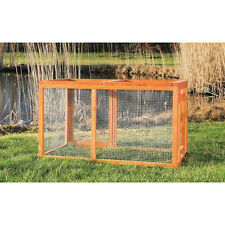 The Patio Wise Chicken Pen/Run carries a one year manufacture warranty. The c onvenience of the folding feature allows for easy storage, travel, cleaning, overall its a great feature. All backed by our one year warranty. This house is designed with a living room for sleeping, and running area for playing. The green felt sloping roof can protect the coop from water penetration. Your pets will love it! Green asphalt composite material waterproof roof prevent water penetration. Wood construction with red finish. Hinged front and top doors. Extends the size of an existing coop. Easy to assemble. Extends the size of an existing coop. Wood construction with red finish. Using the Original Nesting Box Blend to promote the natural behavior and vibrant health of chickens in the Brooder, the Coop and Nesting Boxes is easy! Our one of a kind original blend is 100% certified organic, effective and has a fresh, clean scent. 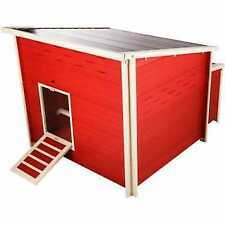 This coop is large enough to comfortably house 2-4 chickens and other small animals such as roosters, rabbits, ducks, and more. With easy access doors and locking systems, it makes it easy for you to clean the space, feed your animals, and collect eggs. CUTTING BOARD FRESH EGGS WITH FARM BACKGROUND. You will receive the exact cutting board pictured above. We craft each cutting board individually with love. We can usually have custom signs and cutting boards finished in less than a week. (Each size suits different kinds of poultry. Guam, Puerto Rico, Virgin Islands, etc.). CUTTING BOARD ROOSTER WITH FLOWERS. You will receive the exact cutting board pictured above. We craft each cutting board individually with love. We can usually have custom signs and cutting boards finished in less than a week. CUTTING BOARD ROOSTER WITH FLOWERS. STYLE: Kitchen Rustic Farm Decor. You will receive the exact cutting board pictured above. We craft each cutting board individually with love. We can usually have custom signs and cutting boards finished in less than a week. Easily dispose of droppings for a more sanitary coop. Keep chickens clean and healthy. Unless otherwise noted My Quick Buy. You will receive notification of any delay or cancellation of your order. Check-Out Now! 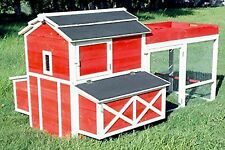 This spacious coop, which can comfortably hold 6-8 hens, provides a safe and secure habitat to raise chickens, giving you access to fresh eggs, and the ability to grow your own herbs or flowers in the rooftop planter boxes.